The bathroom is one of the most used rooms in a homeowner’s house, which is why homeowners typically have a lot of fun with bathroom remodel projects. At ProSource® of Dulles, we provide many different kinds of bathroom remodel products, so you can help your homeowner client turn their bathroom into a day spa paradise. 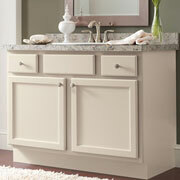 Bathroom sinks serve both functional and decorative purposes in a bathroom. 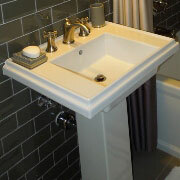 Our sinks come in simple and unique designs, including styles such as shroud, vessel, pedestal and standard. They also come in different colors, shapes and sizes, so your client can get as customized as they’d like! 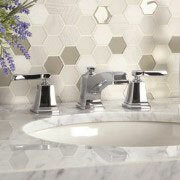 Bathroom sink faucets serve the functional purpose of releasing water into your clients sink; however, choosing the right one can really change the ambiance of the room. Faucets come in a variety of colors, materials and handle types, which can add a stylish sense of flair to the bathroom your client’s guests will likely notice! The shower is an element of the bathroom that is used almost daily, making a shower remodel project something that shouldn’t be taken lightly. Your client can make their shower as fancy as they want, and our selection of shower heads, faucets and handles can help them create their perfect shower! Bathroom vanities not only will save your client counter space by adding storage, but a bathroom vanity with customized mirrors and lights will also add a sense of their personal style. Our vanity selection can fit any of your clients’ styles, whether that’s traditional, modern, classic, contemporary, or something completely different! The tub is a main focal point in the bathroom, which is why it can be fun for your client to get creative and detailed when upgrading their bathtub. 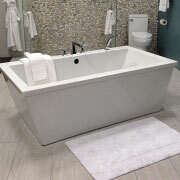 Our tub materials include fiberglass, porcelain, stone, marble and more, and we also supply unique styles of tub faucets and hardware. 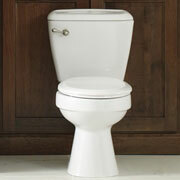 The toilet will likely be the most used element of your client’s bathroom remodel, and we have a broad selection of toilets that are bound to fit their needs — both functional and decorative!